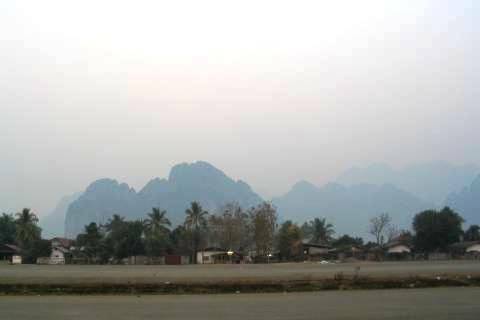 I took a morning stroll around Vang Vieng. There was little motivation to do anything more. Long rides into similar landscapes and settlements were dulling my senses, diminishing my power of observation. To continue making the ‘best’ of my time here by forcing myself to visit popular sights seems to defeat the purpose of a relaxing holiday. So after a lazy morning, I went back to the guesthouse and packed my stuffs for departure. On the easy roads back to Vientiane, I took a side road to Thalat, a town known for its exotic food. Instead, I found numerous guesthouses and pretty river views. 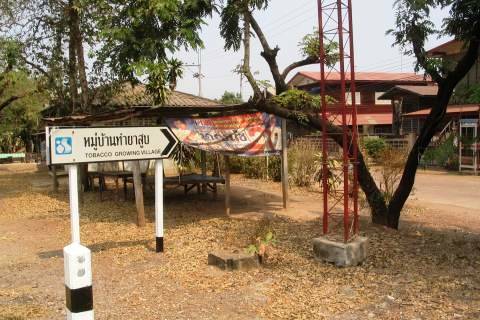 I continued to Vientiane to find that the guesthouses I have short listed fully occupied. In the end, I splurged on a US$16 room at Riverside hotel. It has a lift. The staffs saw me took a photo of it. 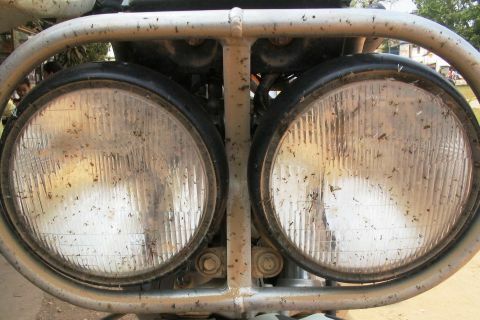 Next, I returned a fishy smelling Baja with squashed flying insects to PVO. The rest of the day was spent watching TVs, visiting the excellent Laos musuem, eating good food and planning my way back to Bangkok, Thailand for my Airasia flight back to Singapore. Riverside hotel did provide an affordable package for traveling from Vientiane to Bangkok. But as usual, I like to go through the logistics myself and taking a little risk by not booking the train ticket from Nong Khai to Bangkok in advance. A little risk gives me a little excitement and makes me feel alive. I woke up at 7am, packed quickly and took a costly cab to the bus station. With some help from locals, I managed to find the public bus to the Friendship pass. The buses do not have any destinations marked in English. The bus ride cost 4k Kips. At the border, I paid another 15Baht to cross the bridge on a minibus. At the other side of the bridge, I hired a Tuktuk for 40Baht which took me first to the train station where I bought a sleeper to Bangkok and later to Mut Mee Guesthouse at Nong Khai. Mut Mee Guesthouse has got to be one of the prettiest, coziest and friendliest guesthouse I have been to. 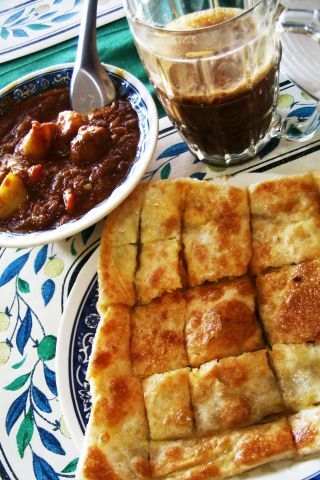 It has a rather unique style of operation and offers a good range of services for travelers. However, the presence of so many westerners somehow makes the place less appealing. 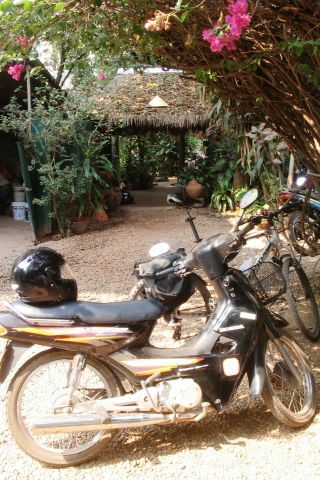 I had lunch and left my backpack with Mut Mee before I headed out and rented a Honda Dream to explore Nong Khai. I contemplated visiting the Dinosaur museum but found that it is too far and I do not have great confidence with the light motorbike. Evening quickly arrived and I took a ride to the train station where I boarded an overnight train to Bangkok. At Bangkok, I visited the popular Chatuchak market. At noon, I took a cheap public bus to the airport for my flight home. Interestingly, the last entry in my note book is the following: “It’s just that he’s cannier and smarter than he lets on, and in the shippage between what he looks like and what he is, there’s a lot of freedom”. I can’t remember which book I was reading at that time. 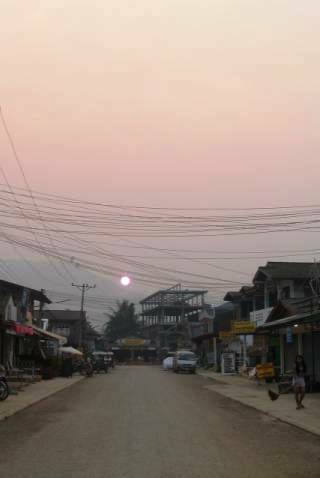 This entry was posted in Laos, Motorcycle Adventure Vacations and tagged Nong Khai, Vang Vieng, vientiane by atticus. Bookmark the permalink. There is a great loop ride to the west of VV over the suspension bridge. It winds it way around the karsts, through a few villages with river crossings and toll bridges to add to the fun. Several caves and the Blue Lagoon are worth looking at whilst there. Best done early in the morning before the backpackers make their way out.